Rejuvenation eager to deck your abode. For free. Yesterday found us ranting about our recent Mid Century Modern cabinet hardware score for our built-in linen closet project. Today finds us giving away $300 worth of Rejuvenation inventory. To you. Relentlessly searching for matching sets of vintage hardware or lighting. Scour Ebay, salvage, and vintage shops only to find incomplete sets or non-matching finishes. Groan. Mutter, "Wish this stuff was still sold new so I could just buy what I need." • Include link(s) to said product(s). • Feel free to Tweet it to @atomicindy or Facebook it on Atomic Indy Facebook page to increase chances. Entries open through Monday 8/3/09 at 5pm PST. Winner announced Tuesday 8/4/09. Not entering the contest, as I'm a previous winner. Just want to compliment the awesomeness of that new linen closet - great as always! Love the asymmetrical color blocking, and of course the surprise orange. Lovely! Closing on our MCM house tomorrow, and those cabinet pulls would help a lot in our efforts to bring back the MCM-ness of the kitchen! Thanks so much for giving us this chance to enter! A Nimbus fixture in the kitchen would be fantastic. I could finally take down that awful mini ceiling fan. What a horrendous piece of junk that thing is. And then I'll have 30 of the Peg knobs, one for every cabinet and drawer in the house. Man, I wish they made door knobs in the same shape as those Peg knobs. Anyway, check out my blog about my mid century modern home renovation. Two Nimbus flush-mount fixtures in aluminum finish to replace the dreadful 90s-era "improvements" in our hallway. I have been lusting after the "dish" knobs with the star backplate for some time. But I think I would match them up with the "boomerang" just to keep it interesting. And since I probably wouldn't need $300 in drawer knobs, I would get this awesome kitchen light! I love it! Moved into our home four years ago and immediately updated the kitchen with finds from the local big box stores. Then, we discovered Rejuvenation. We updated the remainder of our house, room-by-room, with period-appropriate fixtures; but we still have the plain-Jane, big-box fixtures in our kitchen. Given the opportunity, I’d add a Nimbus on the kitchen ceiling and an Orbis over the sink. All in brushed aluminum, for sure. I absolutely adore my 1948 brick ranch, but finding appropriate lights and fixtures are a nightmare! I frequently browse rejuvenation and image all their beautiful mcm designs fitting seamlessly in my house! What stands out the most is the Streamline Doorbell. I never saw what mine looked like but I have been looking at the hole where it was for 4 years. Rejuvenation is my new favorite lighting source! We're getting ready to add a bath and re-do another and it will provide awesome matches for our modern, industrial house. In addition, I need a small pendant for my studio and the Otis has definitely caught my eye (http://www.rejuvenation.com/fixshowW285/templates/selection.phtml). The Aeros Tri is exactly what we have been searching for! This would be just perfect in our loft above the book cases. With the floor-to-ceiling windows in the front, this beautiful thing would be the envy of the neighborhood! The Dora pendant would be a much more sleek source of lighting above our kitchen sink. Currently we have a stop-gap plastic fluorescent bulb fixture hidden behind the cabinetry. I'd update the cabinets with polished chrome square cabinet knobs to match. Wow. My husband and I are currently remodeling a 1960s ranch home in Seattle. We just scored a nice minimalist hanging globe light at an estate sale ($10!) for the dining room, but our next big project (cue horror scream) is completely remodeling our kitchen. We need lights to go above an island, and 2 Orbis Lamps will fit in perfectly with the kitchen that's alive and flourishing in our minds. With a few of the amazing Dish Knobs with Star Backplates and we're well on our way to making our mid century dreams come true! Oooh, I love the Dora! It would definitely take some thought, though, because the options are lovely. Just bought my first condo and aiming to add some good-lookingness. Love the "Whale Tale Pull"! We're in the planning stages of renovating our vintage 1958 pink bathroom and these would be perfect for our linen closet! Absolutely love the Astro Desk Lamp. It would live right here on my desk. My furniture is retro but for some reason I still have a big 1980's ginger jar type lamp here ... this would be quite the improvement! I've completely gutted my kitchen and dining room and the project is almost complete. Two Aeros pendants would fit perfectly over the island that separates the two rooms. Love them! If those Skyports aren't the hottest thing to hit a ceiling since this summer, I don't know what is. I can't tell you how much this would help our kitchen. I'm in LOVE with the Aeros Tri (http://www.rejuvenation.com/fixshowC445/templates/selection.phtml). How does that work, though--could the winner pay the difference if it's over $300? Alas, we just bought our place so we're not exactly able to buy awesome light fixtures at the moment. The wood spreader would look beautiful with our chairs and having a great starting point like this would finally get me going on hanging some fantastic MCM wallpaper I've been fantasizing about. I am redoing my office and LOVE to see two of these Bruno table lamps doning our vintage steel case desks. LOVE THEM. Just took some 1940s era lamps to Midland Antique Mall to make room for a couple of modern choices. So I would happily add an astro lamp to my bedroom. 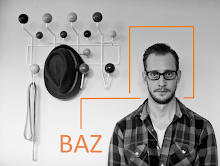 Baz, you and Rejuvenation are terrific! Have have a nice big open space over my dining room table that really needs an Aeros Tri! Just look at the space and you tell me if I'm wrong. I would kill for the Aeros Tri to hang over our dinning room table. There are the exact same lights in my wife's grandfather's amazing mid-century. To replace the damaged side porch light, we'd like an "Otis". Wow, it's so hard to choose! Ever since we moved into our 1952 brick ranch last year, I've been coveting the Hewitt three-light pendant, hoping to put it in an unlit corner of our front room. It matches a single pendant that we have hanging in our stairwell (and is unfortunately the only original fixture left in the house). Of course, the Aeros Tri would also look great in that spot. Too many good choices! We are also in dire need of new lighting over our dining table, to replace the horrible industrial fluorescent fixture. I'm thinking three-in-a-row of either the Orbis or Aeros fixtures. Either would like nice with our white elliptical dining table and Danish modern chairs. I've definitely got my eye on the Aloha sconce for use in our stairwell. Either that, or the Donald sconce. Both are lovely! The Orbis pendant could most certainly live quite comfortably in our dining nook, a definite upgrade from the sad 80's style pendant that's there now. A few classic and simple peg cabinet knobs in the kitchen and perhaps our house is that much closer to the modern home we're working towards. Thanks for linking to a great future resource! The Apple-Green Gourd Table Lamp would look really playful in front of our red accent wall. 3-way switch allows it to be used for both ambient light or reading light. 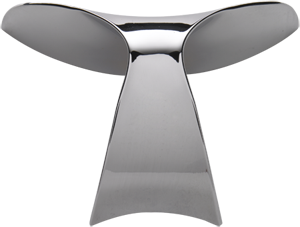 whale tail drawer pull in chrome. probably around 10 of them. we bought a fixer upper and unfortunately the kitchen had to be gutted (broke my heart!) but the whale tail drawer pulls will probably grace the ikea drawers we're putting up in it's stead. in addition, we do have a laundry closet much like yours - we'll probably go with your idea of the star backplate with the saturn knobs (four) in chrome. because we have a pink bathroom (yes, in mamie pink!) we'll get a toggle plate in porc. white. by the mirror in the pink bathroom, it'd probably be flanked by two selma wall scones in porc. white. Classic Aluminum Flush Ceiling Fixture with the fab green globe (Item # AA 1503) in my weekend home's kitchenette. It would look great with the original one piece white porcelain stove/sink/fridge unit that's still there and working like a charm. Thanks. Awesome contest. $300, of course I could spend that on just one item. 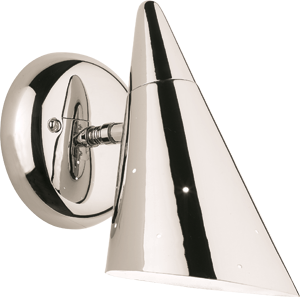 We would love a 'Donald' double sconce (item # AB 6694)in brushed nickel for the light in our main stairwell, this might be very similar to the actual light that was once there. I'll play! Two Nimbus for our kitchen. I know the perfect place in my house for the Aeros Tri. I would just need to convince Paul of it. Egads. The Dora for me too. This is too gorgeous and would do very well over the kitchen counter. This is such a great line of fixtures! "Closing on our MCM house tomorrow, and those cabinet pulls would help a lot in our efforts to bring back the MCM-ness of the kitchen!" Whoops, I forgot to link to the product. I think we'd go with $300 worth of the Dish Cabinet Knobs with Star Backplates. But I also really like the Otis and the Aloha. Argh, and closing got delayed until next week for our MCM dream house. If I were the fortunate winner, I would use an Aloha sconce to replace the lovely, ornate, and completely inappropriate sconce that is in my hall. The existing sconce would then be taken to the Habitat for Humanity Home Store so that it could be found and used by someone in a more appropriate setting. Wow, Rejuvenation is wonderful! After countless weeks searching without success for appropriate lighting for my dark interior ranch hallway, I find this gem, Cove: Atomic Age Flush Ceiling Fixture. It is absolutely perfect!! I'd place one at either end of my hallway, turn them on and just sit in a chair and admire my gorgeous, perfect hall lights! Guess I'm simple. All I want is a brushed aluminum Nimbus for my attic bedroom. It's a step up from my Ace Hardware Special, but not too flashy or low hanging to hit my head. I want a flush mount to go over the bed. The house is a small brick urban cottage from the 1920s, ours since the 1970s. We preserved light fixtures from the previous owners in most rooms but this one. It was a sewing room before we had it. As a teenager I drew cartoons in crayons on the door that remain to this day. I want a nice touch of style. The dorena would be perfect above our built-in breakfast nook! to light our back deck? Mama needs a new modern chandelier! The Orbis Tri would live happily above our Eames collection in the dinning room. Don't you think? Adding to my prayer for a brushed aluminum Nimbus light fixture, Lord, the other light fixtures in my 1920s house are all 1950s or 1960s Mid-Century Modern. My dining room boasts a large brushed aluminum contractable pendant chandelier, George Jetson type. The corresponding room in the attic, next to the room where I want the Nimbus, also sports a Nimbus-type flush mount fixture in brassy finish. My kitchen light is a double-ring phlorescent tube with a pull chain, same era Modern. The bedroom on the main floor dangles a boxy wooden frame with Cowboys and Indians motifs, just beautiful vintage stuff. The home office has a flush-mounted old seaman's steering wheel like Gorton's fisherman. I want the Nimbus to fit in with our assets, Rejuvenation's design with authentic rock-n-roll designs. Please have mercy, God is love! Wow, what a great contest!!! If it applies to Canucks, I could really use a fixture in my tiny apple-green retro-accented kitchen. Current cobalt blue glass cone pendants with halogen, suspended from a curvy metal track, does not emit enough light and the halogen light is too pin-pointed, rather than ambient. Plus, it won't take energy-efficient ... Read moreCFL bulbs. 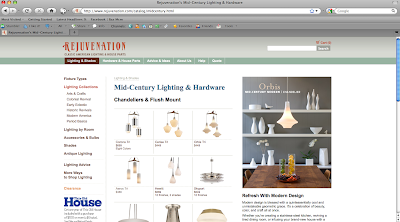 My faves are (random order) the Hewitt, http://www.rejuvenation.com/fixshowC122/templates/selection.phtml?n=v&custom_code=xc7f&tab=room&setting_id=81 polished chrome and tubing rather than cloth-covered cord ; the Orbis Tri http://www.rejuvenation.com/fixshowC468/templates/selection.phtml?ref=1 ; or the Corona Tri http://www.rejuvenation.com/fixshowC526/templates/selection.phtml?n=v&tab=room&setting_id=169 . The Skyport http://www.rejuvenation.com/fixshowC497/templates/ in polished chrome is also great. We just scored a 50's blond dining table from Domistyle in Fountain Square (my new goto place for cheap vintage!). The Aeros Tri http://www.rejuvenation.com/fixshowC445/templates/selection.phtml would look so much better above it than the kinda, sorta mid century looking fixture that we got from Lowes! So many things to choose from that this is very tough, but I think the Corona tri in Neptune Blue would be the perfect replacement for the Home Depot fixture in the kitchen of our soon-to-be home. We'd need to pick up the difference but it would be well worth it. Thanks for putting together such a great opportunity! Oh yay, I <3 Rejuvenation! What an awesome contest, especially as we're just about to move into a new home. I love Rejuvenation! And I'd love a Dora pendant too! The Skyport would make a cool fixture in our 50's themed kitchen. I think it's clear that the only thing missing from our awesome phone nook is the awesome Dora pendant. With the remaining cash we can easily add these polished chrome dish cabinet knobs w/ star backplate to our original aqua tile bathroom. Thinking it would work swimmingly in a set of two or three above my kitchen sink. Just finished a kitchen remodel with the Orbis pendant lights. Our 1957 Rancher would be so happy to have the NIMBUS grace its hallway. It is so hard to find quality fixtures to fit a MCM home, Rejuvenation has been a great source. Also *love* the classic Aero Tri. I can def see it gracing my entryway. Love Rejuvenation! Thanks for the opportunity, B! 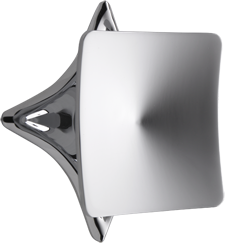 The atomic, space-age lines of the Aloha sconces reflect my passion for the Mid Century Modern era. Our stairwell desperately needs these fixtures. Had the electrician put out the outlets, but we ran out of money to buy them. I'd get two of The Cove in polished nickel. This is is a truly awsome contest! Would love to see the Corona hanging above the pass-thru from our kitchen to the living room. In all-brushed aluminum of course! Glad I found you and just got in under the wire! My danish dining room table yearns for this light casting down! I think the food would taste better! We are currently remodeling our kitchen, and we are doing all the work. It's been a fun learning experience and there is a great sense of pride in doing it yourself. Financially, it was really the only way we could possibly afford to make it happen. I have actually been drooling over the Orbis Tri Chandelier for months now. It would be a dream to have it along with the matching pendant. Yes, I know it's over the $300 budget, but I would happily pay the difference if it meant having that stunning Chandelier. If I have to stay in budget, the peg knobs are to die for too. I have no lighting or hardware yet, so I'd be happy with anything!